Bodrum is a seaside city in Turkey’s Bodrum Penninsula which stretches from the country’s southwest coast to the Aegean Sea. Bodrum City features two bays with views of Bodrum Castle. 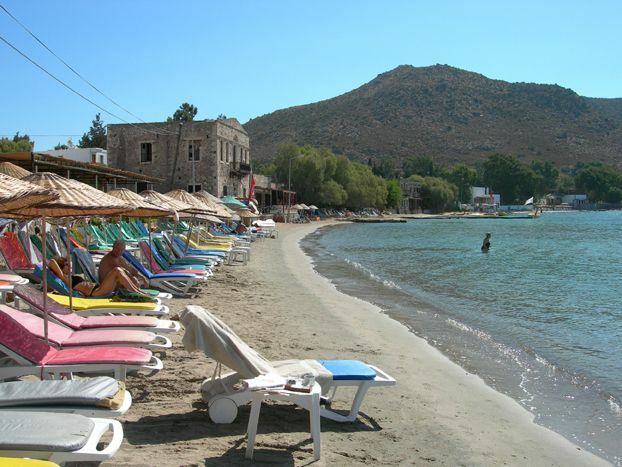 Bodrum City serves as a gateway to beach towns and resorts in the area. The city has also become a popular port of call for some cruise ships who ply the Med and Aegean Seas. Bodrum means sun, sea, history, and shopping. It’s a perfect destination for everyone! We recently spent a day in Bodrum, it was a port of call on our cruise aboard the Celebrity Reflection. The cruise terminal is located at one end of town and is an easy walk to all the sights in the city. And if you’re just looking to stay in the city, no worries, there’s lots to do to fill your entire day! Here are 6 things to do in Bodrum City! Also known as St. Peter’s Castle, it is medieval fortress completed in the 4th century B.C. 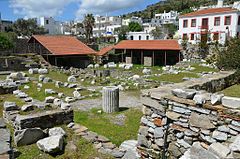 which was partly built with stones from the Mausoleum at Halicarnassus, one of the Seven Wonders of the Ancient World. The castle is a great example of Crusader architecture. It is built on the site of the ancient city of Halikarnassus. The castle grounds host several towers and halls which house different exhibits. A must see is the Carian Princess Hall which showcases a gold crown, necklace, bracelets, rings and an exquisite wreath of golden myrtle leaves. They belong to a woman of high status, possibly associated with Ada, the last Carian Princess. The jewelry owner’s skeleton was found in the heavy terracotta sarcophagus on display here. While at the castle don’t forget to walk the ramparts for awesome views. Admission is 10TL about $6 and includes the Museum of Underwater Archaeology (Sualtı Arkeoloji Müzesi) which is housed within the castle. 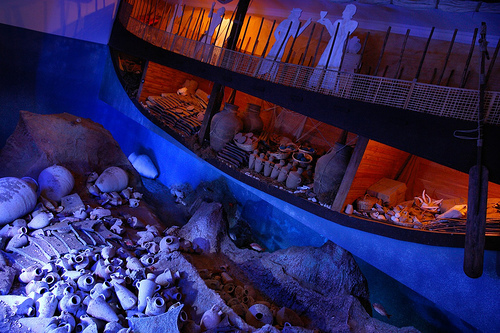 Visit the Museum of Underwater Archaeology (Sualtı Arkeoloji Müzesi). This museum is housed in the Bodrum Castle. It is the largest museum in the world devoted to underwater archaeology. Here you will see finds from ancient shipwrecks in the Aegean. This museum has a fine collection of amphoras, ancient glass, bronze, clay, and iron items. Most of the artifacts date from underwater expeditions by the Institute of Nautical Archaeology (INA) after 1960. The INA excavated several wrecks, some dating back to the 14th. Century BCE. The glass collection is a definite must see! 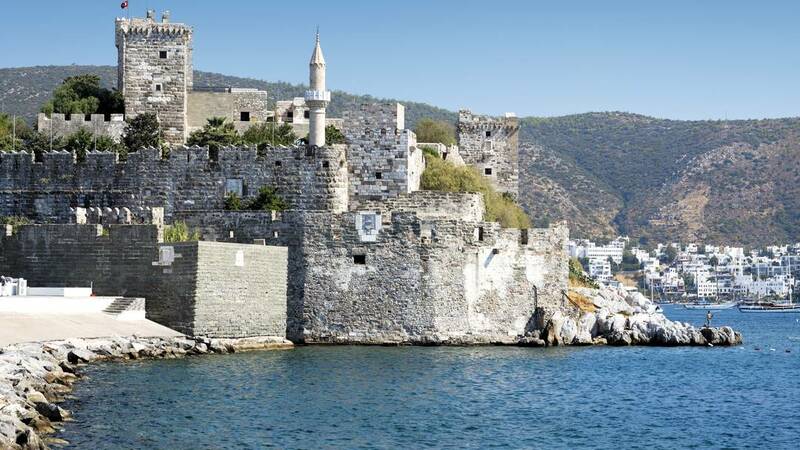 If you haven’t had your fill of historic structures you can walk over the the site of the Mausoleum of Halicarnassus, it’s about a 13 minute walk inland from the Bodrum Castle. The once magnificent monument tomb was built by order of King Mausolus of Caria. It was one of the 7 Wonders of the Ancient World. Unfortunately today not much remains of this ancient wonder. It was destroyed by the earthquake of 1304 and many of its stones were used to build the Bodrum Castle. You can wander thru the excavation and the gardens, and have a look at some of the battle scene freizes on display. Window shop or shop at the town’s bazaar. You can’t miss the bazaar, you pass it on your way to Bodrum Castle! 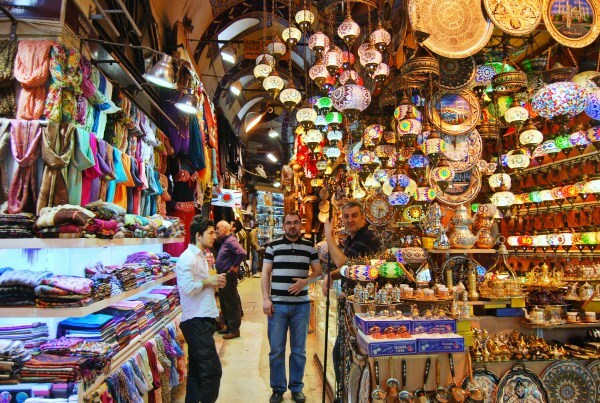 It’s filled with all sorts of things from “original fake” bags to Turkish handicrafts and souvenirs. Before you decide to make your purchase remember to bargain! It’s expected! 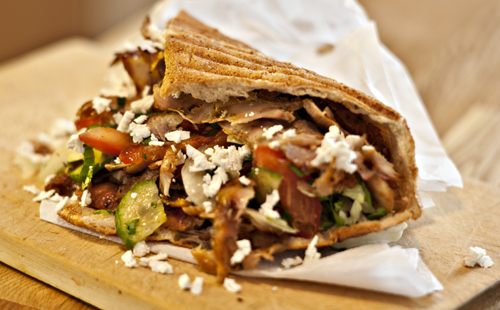 While you’re there try some Turkish street food. I love Turkish Lokma, sweet fried dough balls! Doner Kebabs are delish too! 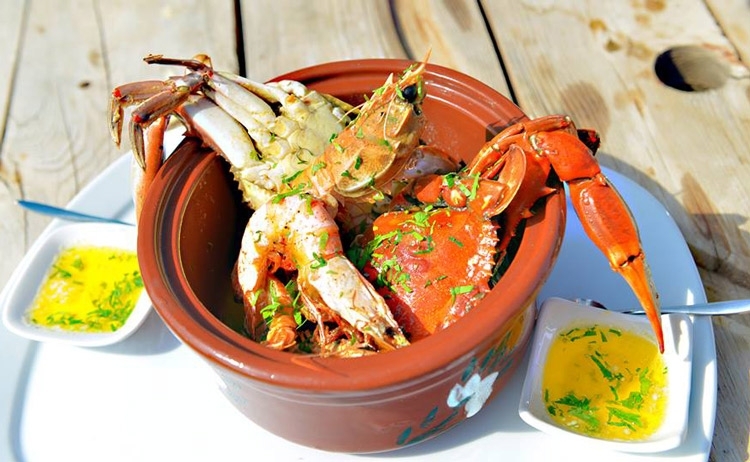 Grab a meal or snack at one of the seaside restaurants. All of them have comfy seating under an umbrella and awesome views of the castle! 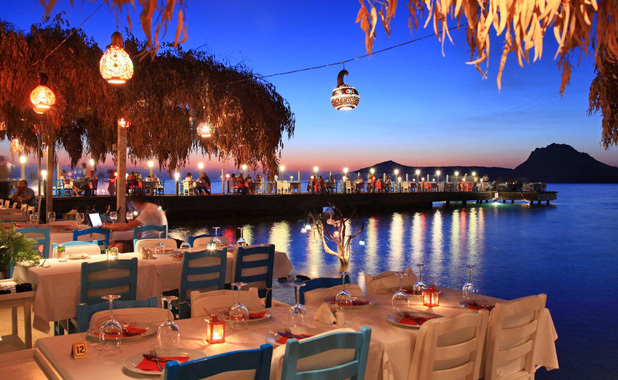 Find a table right by the beach and you can dip your feet in the water while waiting for your meal. I did! Stroll along the wide seafront corniche. It’s a pretty stroll with views of the castle and the town. There are even playgrounds along the way so stop by and let the kids play for a while. There are many cafes and bars along the way if you want to stop and have a drink or snack. Small fishing boats dock along the corniche. You might catch a local fisherman fixing his nets. Stop by and say hello, they’re very friendly! There are many more things to do in and around Bodrum if you have the time. You can spend some time walking the harbor in front of the castle, that’s where the big yachts are! 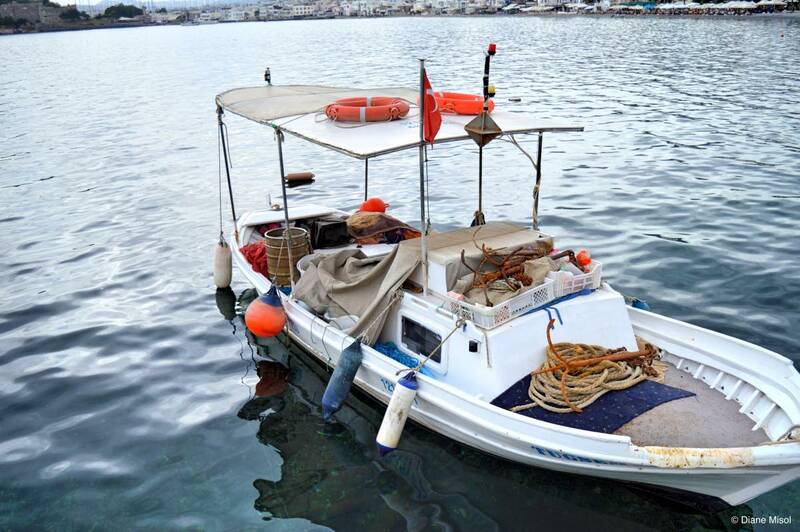 Or you can go on a boat trip along the Bodrum Penninsula for the day. You’ll see the coastline from a different perspective and stop at some popular beaches. If boating isn’t your thing take a day trip to one of the surrounding villages or resorts. You can take a road trip to the ancient city of Ephesus, it’s just 2 1/2 hours away. Kusadasi is a Turkish beach town on the Aegean Coast. It’s a popular tourist destination and has become a port of call for the mega cruise ships on the Mediterranean route. There aren’t that many things to do in the town itself unless you’re an avid shopper, there’s plenty of shopping at the local bazaar. But there are many things to do in the area whether you’re a history buff, a sun lover, or a thrill seeker there’s something for you at Kusadasi. This Turkish town has a some fun family friendly activities. So whether you’re there for the day or a week I’m sure you’ll find something fun and interesting to do! Kusadasi is always a port of call on the Med cruises we take so we find ourselves there at least once or twice a year. 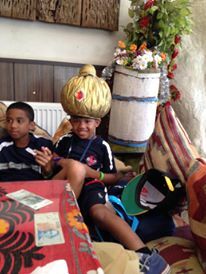 Our kids and grandkids have been with us on many of those cruises and they always look forward to a day in Kusadasi. Here are 4 of our favorite family friendly activities in Kusadasi. Kusadasi serves as one of the gateway towns to the ancient city of Ephesus which is on the UNESCO World Heritage List. Ephesus is a city that dates back over 2000 years. 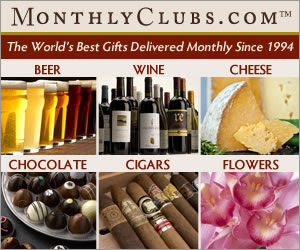 It played important roles in ancient Greek and Roman times. It was the trade center of the ancient world, and a religious center in the early days of Christianity. Yes it was here that Apostle Paul preached to the Ephesians. Today it is a major tourist site in Turkey. 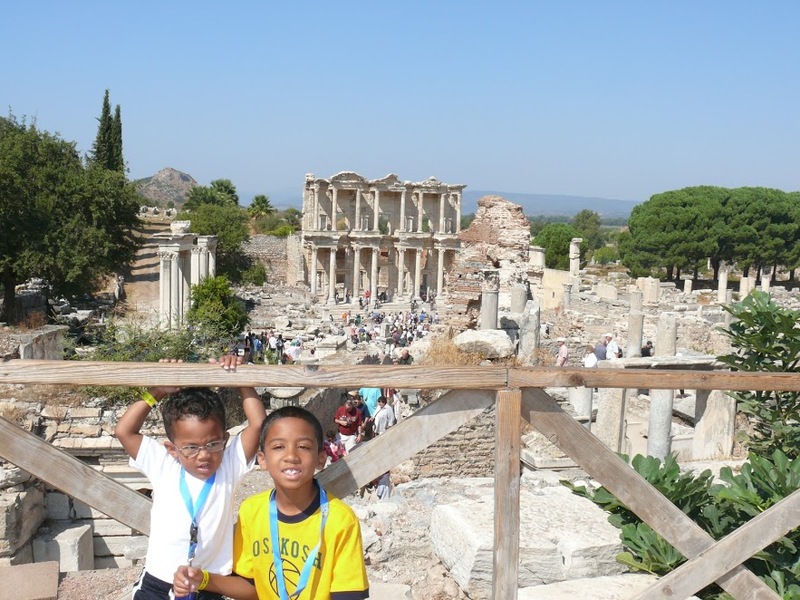 A visit to Ephesus will take you back to how the Greeks and Romans lived 2000 years ago. The well preserved columns and buildings are definitely worth the trip. Other important building and statues include the Odeon, the Hercules Gate, the Terrace Houses, the iconic Celsus Library, and the Stadium. Believe me there are many more sites than these. My grandson Dion thought the Nike relief was pretty cool. He pointed out the “swish” that the athletic shoe company has adopted as their logo. The girls and I entered the Terrace Houses, the boys decided to stay outside with my husband. They had fun climbing some of the blocks in the area. We really enjoyed the Terraces Houses, the mosaics and frescos are so well preserved, some of them look like they were painted recently! The Terraces Houses are definitely worth the time and admission price! The site is located about 30 Km. and is easily accessible by taxi, minibus, or you can book a tour. If you decide to go on your own, that’s what we always do, the best way is to negotiate a deal with one of the many local taxi drivers. We can usually hire a mini-van that will take us to the site and back when we’re done for about $75. The mini-van easily seats 6. You can purchase tickets at the entrance. They cost 40 TL, about $10, this tickets allows you entry to the site, but not into the Terrace Houses. You can buy tickets to see the beautiful mosaics in the excavated houses at the main entrance for 20 TL, about $5, or if you’re not sure you want to go in then buy them at the entrance to the Terrace Houses. There are other archaeological sites around the area and can be combined with a visit to Ephesus. You can visit: the Temple of Artemis, it is one of the 7 wonders of the ancient world, sadly today there’s little left of the site, but admission is free and kids don’t mind scampering around the site; the House of the Virgin Mary, the small dwelling where some believe she spent the final years of her life, admission 20 TL, about $5; Basilica of St. John is built over the supposed tomb of the apostle, admission 10 TL, about $2.50. The Ephesus Archaeological Museum is a good place to visit after a trip thru the ancient city of Ephesus. The museum is in Selçuk, not far from Ephesus. It houses many artifacts found during the excavation of the site. Most notably the statue of Artemis from the temple of the goddess in Ephesus. Admission 10TL, about $2.50. The museum isn’t very big, you can see everything in about an hour or so. The kids thought it was interesting, but best of all they loved the fact that it was a short stop! When you’ve had your fill of museums and ancient sites spend a day at Adaland! 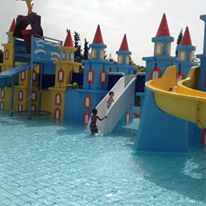 There are 3 waterparks in Kusadasi. Adaland was voted one of the best in Europe. We spent a day there last summer and the kids had a great time. There are activities for all ages. Jett loved the splash zone and the older kids, and adults loved the water slides. Admission is €17 for kids 4-9, €24 for everyone else. Children 3 and under are free. Admission includes use of pools, slides, changing room, locker, lounge chairs, and umbrellas. Some activities like rafting may incur an additional charge. There are also wandering photographers in the park that love to take photos of you and the kids. You don’t have to buy any of the photos, you can view them at the photo kiosk and buy prints or a thumb drive with all the photos. That was the best buy and we ended up buying one. The park also has snack bars and restaurants that serve everything from pizza and fries to Turkish kebobs. 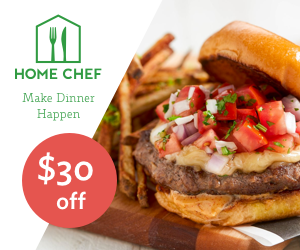 They’re reasonably priced and the meals are actually pretty good. Hone your bargaining skills at the Kusadasi Bazaar. The bazaar is filled with spices, souvenirs, toys, leather goods, jewelry, and more. The kids always find something to buy and have a great time wandering the little alley ways. There are also many cafes and restaurants in the bazaar. Your favorite fast food chains like McDonald’s, Burger King, and Popeye’s are there too. 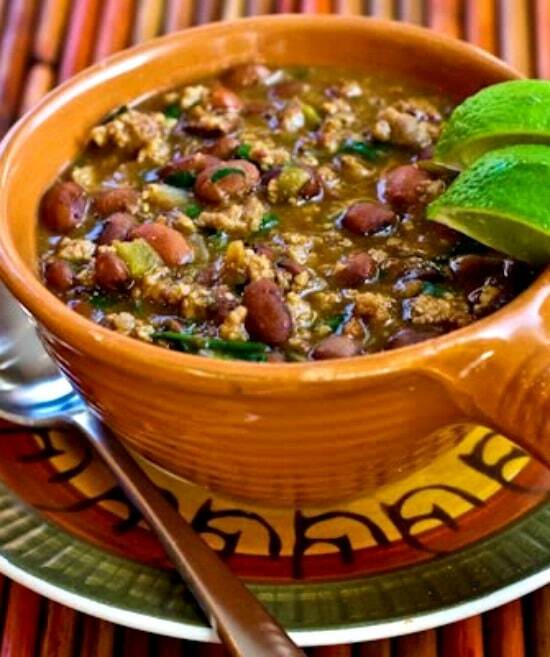 We always opt for local food at one of the restaurants. The kids love the chicken kebobs and for dessert sweet cheesy Kunafe. When you’re done shopping and eating take some time to wander the waterfront. There’s a park across the street and seafood restaurants by the port. You can also hike over to Pigeon Island. It’s attached to the main island by a causeway. You’ll find seashore restaurants there as well a fortress once used to guard against pirates. While on the island you can see nice views of the harbor and the town of Kusadasi. If you still have time to spare try out one of the beaches. Hire a taxi or ride a public mini bus from the town center to one of the area beaches. The water is warm and the beaches are nice. Two popular beaches are Ladies Beach and Long Beach, both are organized and have sun loungers and umbrellas for rent and have cafes and restaurants. Kids always love the beach! Why do I love, love, love Instanbul? Let me count the ways! 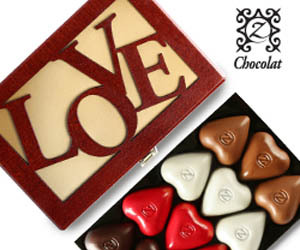 I love the people, the culture, the art, the sites,the architecture, the shopping (oh the shopping! ), and most of all the food! Istanbul though not the capital of Turkey, (the capital is Ankara), is a major Turkish city. It straddles 2 continents, Asia and Europe through the Bosphorus Strait. The city is the melting pot where East meets West. This city has a checkered past and played a strategic role in the area’s history having been settled and conquered by the Greeks, Romans, and Ottomans. The area was probably inhabited as early as 3000 BCE. In the 7th. Century BCE it was colonized by King Byzas who after consulting the Oracle of Delphi choose the site to establish the city he called Byzantium. By the early 100’s BCE it became part of the Roman Empire and 306 CE the Emperor Constantine made it the capital of the Eastern Roman Empire or the Byzantium Empire, and renamed it Constantinople. Finally in 1453 it was conquered by the Ottoman Turks who made it their third and final capital and renamed the city Istanbul. Istanbul has certainly been through centuries of turmoil and upheaval. Every conquering power left it’s mark making this one of the most beautiful cities in the world. It’s certainly one of my favorites. The city is basically divided by the Bosphorus Straight, one side is Europe and across the bridge is the Asian side. 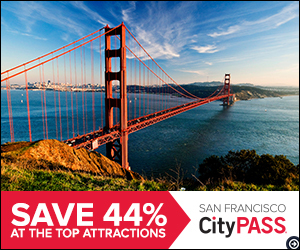 The Old City where you’ll find many of the famed historic sites is on the European side. The Asian side is mainly filled with quiet high end residential homes, but has some historic palaces and bazaars. It is where you’ll find modern malls complete with high end shops. You’ll also find the yogurt of the gods there, that decadent creamy ambrosia that Tarihi Kanlica Yogurdu has been churning out since 1893, if you have time it’s worth the trip. We try to visit Istanbul every year, though with recent upheavals including the failed coup last summer we’ve sadly avoided the city the last couple of years. One of my friends visited the city last year with her family. She told me she felt the risks of visiting Istanbul were no more than the risks of visiting Paris, a city that has been recently plagued with violence as well. As she calmly pointed out, if we avoid traveling to cities we love out of fear, then “they’ve won”. So this summer my husband and I are heading back to this beautiful city, but this time without the kids and grandkids. I will not say that everyone should catch the next flight to Istanbul, that’s a decision each person must make for themselves. I will however say that when things settle down, and I hope they will soon, Istanbul is definitely worth the trip! So if you’re planning a trip to Istanbul whether this year or whenever here are my 10 favorite things to do in this beautiful city. 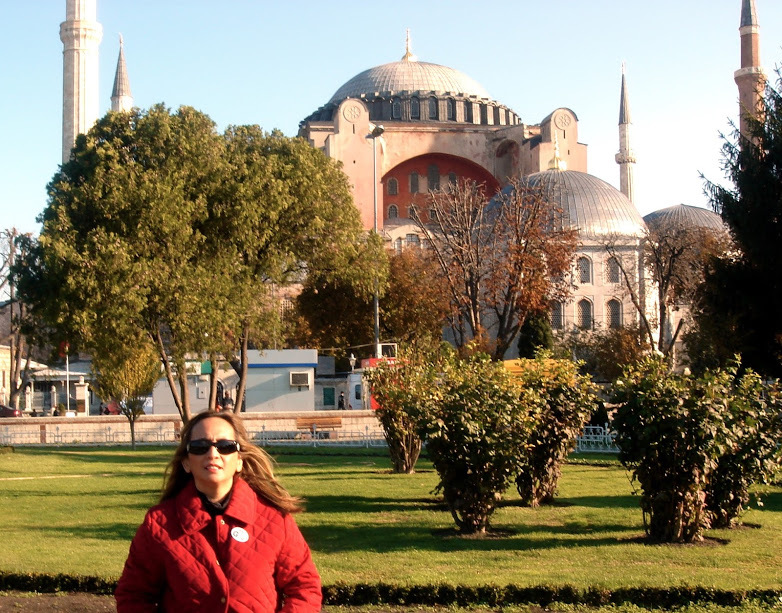 The Hagia Sophia is a must see. It is one of the historical architectural wonders that still stands today. The vast structure we see to day is actually it’s third construction of a building on the same site. It opened in 537 CE during the Eastern Roman Empire Era and was the Empire Church where emperors were crowned. It was renovated as a mosque during the Ottoman Turk rule, and today it is a museum. In the Hagia Sophia you can explore the vast space, wonder at the high ceilings and pillars, and marvel at the beautiful mosaics. The Sultanahmet Camii, popularly called the Blue Mosque is another beautiful must see structure in Istanbul. 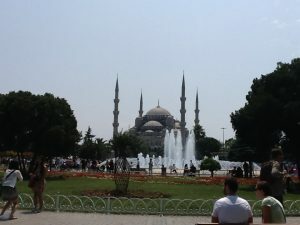 It’s called the Blue Mosque because of the beautiful blue tile adorn the walls and ceilings. This is an active mosque that visitors are allowed to visit, but it is closed to visitors during prayer time 5 times each day. If you plan to visit this or any mosque dress modestly. Both men and women must be covered from the knees up and arms and shoulders must also be covered. Women must cover their heads before entering and everyone must remove their footwear. If you’re not properly attired you will be given disposable sheets that can be draped over shoulders, wrapped around the waist, and used as a head cover. You’ll also receive a paper bag for your footwear. Since you will be in the area after your visit to the Blue Mosque and Hagia Sophia cross the street and spend a few minutes at the Hippodrome. A must see for Dan Brown fans is the Basilica Cistern. This underground structure accessible only by descending 52 steps is a huge reservoir that holds about 100,000 tons of water. It was here that the final scene of Dan Brown’s novel, Inferno, played out. The movie starring Tom Hanks was filmed here as well. The cistern is home to 336 columns in the Corinthian or Doric styles. Look out for the Medusa head columns they’re pretty cool! Located on the Istanbul Peninsula between Sea of Marmara, Bosphorus and the Golden Horn is the Topkapi Palace. Topkapi Palace was once the was the administrative, educational and art center of the Ottoman Empire for nearly four hundred years. Today it’s a museum that houses collections of arms, porcelains, kitchenware, treasures of the Ottoman Empire. My favorite collection is the Imperial Treasury where gem studded jewelry and other objects are displayed. It was hard to take my attention from the Spoonmaker’s Diamond, the 86 carat pear shaped diamond displayed in the collection. It is considered to be the 4th. largest diamond in the world. Also located within the palace grounds is the Harem, the Sultan’s family living quarters. You can visit the Harem by buying a separate ticket. Here you will see intricate carvings, beautiful tile work, and lavish furniture. Don’t leave the palace without strolling thru the grounds and taking in the panoramic views of the Bosphorus. It’s breathtaking! A Bosphorus Cruise is one of my favorite activities in Istanbul. A cruise down this 20 mile strait that connects the Sea of Marmara to the Black Sea gives you a whole different perspective of the city. You’ll sail past the city’s iconic buildings and see some of the beautiful villas and hotels on both the European and Asian Sides. 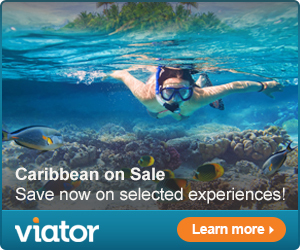 There are many different cruises offered that will fit everyone’s budget. The least expensive way would be hop on a public ferry. There are also hop on hop off boats that service the route as well as private charters. We love the private yacht charters that give you a personal cruise down the strait. It’s a great way to sunbathe while you’re enjoying the sites. Walk around the Eminönü Waterfront. Enjoy a seafood meal under the Galata Bridge. Shop til you drop at the Grand Bazaar! These days the bazaar is a tourist attraction filled with Turkish carpets, leather goods, fabrics, scarves, handicrafts, jewelry stores (my favorite is Birlik, we’ve purchased gold earrings, bracelets, and necklaces from them for years). If you’re looking for inexpensive clothing, shoes, and household goods, shop instead in the streets leading from the Grand Bazaar to the Spice Bazaar. You’re sure to find bargains. Don’t leave Istanbul without visiting the Spice Bazaar! This covered indoor bazaar is second only to the Grand Bazaar. It’s a feast for the senses! Enjoy the food! It’s delicious! Istanbul is not lacking in restaurants, it’s hard to find a favorite. We generally eat when we get hungry. 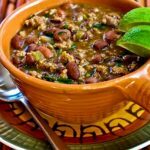 I’ve had a delicious homestyle vegetable stew from one of the little vendors in the Grand Bazaar and enjoyed elaborate meals at one of the many restaurants. Over all I’d have to say my two favorites are Capadocia Restaurant on Hocapaşa Mahallesi, Hüdavendigar Caddesi, No 12, Fatih, İstanbul. 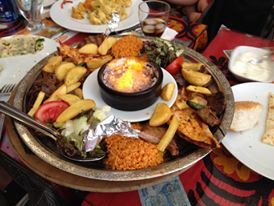 They serve traditional Turkish food in a cozy atmosphere filled with plush pillows. The food is delicious and the staff very friendly! My other favorite, also a local favorite is Hamdi Restaurant on Eminönü. This restaurant is on the second floor and offers great food and panoramic views of the Bosphorus. Reserve ahead, they get very busy. For snacks grab or try to grab an ice cream cone from one of the street vendors. The buying is almost as fun as the eating! The vendor puts on an elaborate show of scooping ice cream taunting the buyer to try and grab the cone from his stick. My grandsons always enjoy the experience. Leave room for dessert! Puddings are very popular in Turkey with pudding shops dedicated to the sale of the creamy sweet stuff. Other tempting treats include different varieties of Baklava (my favorite are the ones is Dürüm, a pastry wrapped in green phyllo dough made entirely of pistachios) and Kunafe a sweet and savory cheese pastry usually enjoyed warm. There are many pudding shops and baklavarias around Istanbul. Our all time favorite is Hafiz Mustafa. 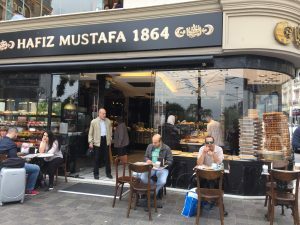 A trip to Istanbul isn’t complete without a visit or two to Hafiz Mustafa for some Kunafe!